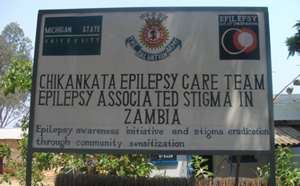 Epilepsy Care Team is a department within Chikankata Mission Hospital. It was founded by Michigan State University under the supervision of Professor Gretchen Lano Birbeck. In 1994 Dr. Birbeck observed that all epilepsy cases came to medical attention due to seizure-related injuries. Only 10% of those cases had ever received treatment and the dosages were inadequate. In fact, most people did not admit that they had burns due to seizures and the Hospital had only recorded 32 cases of epilepsy in the entire catchment area. In 1999 the Epilepsy Care Team came to existence. During this same year a door to door survey was conducted in the catchment area and a total of 892 people were found to have active epilepsy (active meaning they have had a history of multiple seizure episodes). The ECT team comprises of the following members of staff, Professor Gretchen L. Birbeck – ECT Director, Fridah K. Chiwanza – ECT Coordinator, Charles Mabeta – Research Assistant, Sharon K. Moomba – Clinical Officer, Stephen Mulembe – Security. In 2001 Professor Birbeck trained Clinical Officers and Midwives from 9 provinces of Zambia on epilepsy. They were also given a hand book written by Professor Birbeck titled “Where There is No Neurologist”. Between 2002 and 2003 Community Health Workers and Traditional Healers were also trained in epilepsy care to improve care of, and referral of, people with epilepsy. The ECT Department provides counseling services for clients with adherence issues and those that are just starting treatment on a day to day basis. There are 628 people with epilepsy seeking care at Chikankata Mission Hospital. The patients with epilepsy get their treatment free of charge. When a patient comes for review or is a new patient, the patient is assisted by a staff member from the ECT Office who will take their record or medical history, see the physician and get their medication. The ECT register is updated every day. There are also times when Medical Stores has no Phenobarbitone or Carbamazepine and the ECT has been assisting the hospital in Anti Epilepsy Drug (AEDs) procurement. Between 2012 – 2013, the ECT has been conducting School and Church based presentations on Epilepsy. These are brief (20 – 25 minutes) presentations meant to give as much information on epilepsy as possible. The pupils/teachers and clerics/ congregations are then given time to ask any questions that they may have on epilepsy. These have proved to reduce stigma, clear myths and misconceptions on epilepsy. ECT has also received a number of new patients due to the increase in knowledge the people now have in the community because of having heard these presentations. Chikankata Mission Hospital conducts what is called Doctor’s trips. These are trips where a physician accompanied by a nurse and other members of staff, travel to a Rural Health Centres to provide care to patients. During these trips a member of the ECT travels with the group to also provide care to patients suffering with epilepsy. As a result, adherence counseling and registering of new patients is also done. Dr. Kvalsund who is also part of the Epilepsy Care Team will be conducting a study of the nutritional issues in people with HIV neuropathy. This study will help identify the causes of the neuropathies that people who agree to participate in the study have and will help healthcare providers to treat these neuropathies.